My apologies for the rather large hiatus between posts. End of the year got a little hectic and some things just kind of got put off–among them cleaning and writing. While taking a break from working on my ASI indexing examination, tax preparation, and course-preparation for the up-coming term, and contemplating the need to get out the vacuum cleaner, it occurred to me that if you’re cooking for one, you are most likely cleaning for one, too. Now house-cleaning is not one of my preferred activities–I’d rather be watching birds (Project Feeder Watch count), or cooking, or reading one of my favorite British or Alaska mysteries, or just having quality time with the cat. I think that solo dwellers who need to do single-serving cooking, probably also have some issues with cleaning. I’m a renter, which means that I don’t have lots of space, so my wine collection shares my living-room with me and with the cat. Now dusty wine bottles may be perfectly suited to the wine cellar in a fine old family manor in the latest British mystery, but they don’t do a lot for decor in my living room. Predictably, I have to dust them–and that is certainly a house-cleaning activity. As much as I love wine, I don’t love keeping the bottles somewhat dust-free. To add to the issue, I’m allergic to house dust so stirring the stuff up makes my eyes itch, and my face break out–a sure sign that serious cleaning must happen. Needless to say, I’m looking for an “easy” way to address this problem, as well as the blades of the ceiling fans and other high places that are generally out of my reach without a ladder. The vacuum cleaner was not the solution. As you can see, each bottle has its own little cubby-hole, and in order to use the vacuum cleaner, I’d have to lift each bottle out individually, or remove all from one row so that I could vacuum the next row….et cetera. Not a viable solution to someone who does not have the support staff of Martha Stewart, and who does not have a frank OCD. I’ve used torn-up T-shirts for dust clothes–maybe rags is a more suitable term–but again, each bottle had to come out individually, and I’d rough up the corners of the labels. I’ve pondered the cleaning products in the supermarket aisle often, and not given in to the lure of the latest product because I have to wonder what chemicals are added to get all this super-duper dust attraction or magnetism. My better sense tells me that I’d likely be helping the environment and my budget if I did not use some of these products, but stuck with things like white vinegar and the like that my grandmother used. Then a little voice says “but your grandmother was not dusting wine bottles, was not working outside the home….well, you can work through that rationalization for yourself. I succumbed to trying a Swiffer Duster. It took seeing the one with the handle that extends, meaning that I could reach all the window tops, the ceiling fan blades and not have to tote out the stepladder. I discovered that this nice fluffy thing did a great job at getting down the cobwebs, and dusting the ceiling fans, lamp shades, picture frames, and even the fake sunflowers in that huge vase sitting on the floor. Here was a product that made my cleaning easier (not that I’m always “swiffering” around the house–don’t get me wrong). The dusters did not turn me into someone who would rather clean than do all the other things mentioned above. It did make cleaning easier. I might not have kept buying the dusters, but I discovered that the duster was just the right width to slip into each little wine-bottle cubbyhole and at least remove a lot of dust without having to do a bottle-by-bottle dusting, and the fluffy duster did not catch on the wine labels! Now I don’t procrastinate so long between dustings. I still wonder about what chemicals are used, and consider that while I’m using the dusters, but I’m in love with the fluffy little blue thingy that fits onto that extend-able handle. So the barrier was broken–a new cleaning product entered my house. I find I’m much more likely to pick up that duster and use it than I was to even contemplate dusting each bottle the other way. Well, sharing my domicile with a cat is another “problem”–the beast (an affectionately used term) sheds. So there is cat hair in the corners. Yes–you say that the vacuum cleaner takes care of that. Very true–but I have to get it out and use it. I’m willing to do that about every ten days, but what about in between those times? The cat does not shed on my schedule. Well, I discovered the Swiffer Sweeper (while contemplating the price of a new traditional dust mop). Does a great job on cat hair, dust bunnies and other household things on the floor. 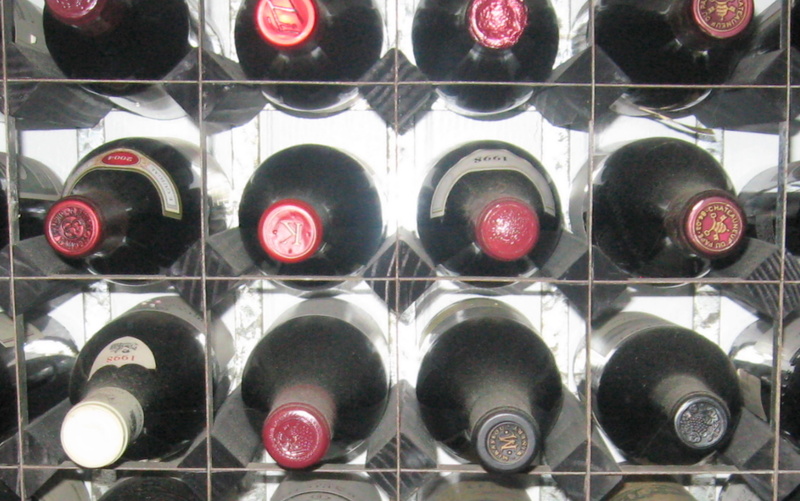 It also goes under the bottom row of wine bottles without jostling them around! So, despite my thoughts about the chemicals, et cetera, I have “dust mop” and dusters in the house. It is much easier to toss that little square of stuff with all the dust attached, rather than having to wash the traditional dust mop every once in a while. It’s one of the “perks” of an allergy to house dust that you have to clean the cleaning equipment every so often. So, I’ve given in to the lure of easy cleaning and chemical assistance with something as mundane as dusting–what next? Enough with the cleaning–time to get back to cooking for myself and the cat!